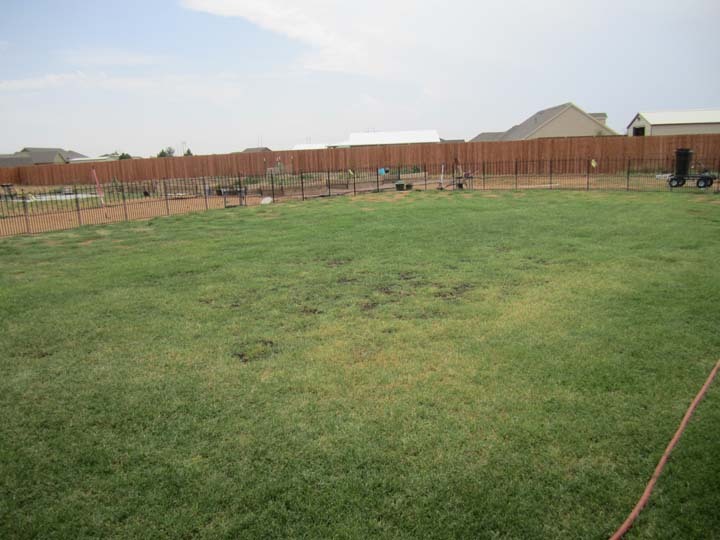 The house in Lubbock sits on a little over one acre with the majority of the acreage in the backyard. Backyard after a rain storm. This is why we needed to grow grass. Fence extends East away from the house & is parallel to the Butterfly garden. Billy Bob Beagle and Betty Sue Beagle were so glad when their play area was green instead of red. The beagles have about 4000 Sq Ft of play area. then we expected and caused many frustrating moments. We like the finished product. Once Bermuda grass took hold, we lessened the amount of dirt tracked into the house by the beagles and us. After 4 years, we are beginning to see sign of deterioration of the fence. We will have to replace about 1/3 of the individual pieces.